All of the Dark Ones descended on Storybrooke on Once Upon a Time Season 5 Episode 11 - but in a surprise twist, someone managed to take all of the dark power for themselves. What did you think of Snow’s plan to leave Emma and go have dinner at Granny’s? Jim: Seemed an awful lot like giving up, Snow and Charming are usually bigger fighters than that. Additionally, does it seem sad that an "appropriate" last thing to do on earth is to spend time at a diner? Allison: I agree with Jim. Snow and Charming completely gave up, and it was foolish of them to think that Emma would do the same. They are a family of fighters, and while Rumple's words were terrifying, the Charmings should have tried to do something other than have one last family meal. Amanda: I agree as well. Snow and Charming giving up felt completely out of character for these supposed heroes. Also, they completely just left their daughter alone to solve the problem. This made no sense to me at all. Robin: Well we're all in agreement; that made no sense. Snow is the Master of Hope, and she gave up much too easily at the word of Rumpelstiltskin. Are you happy or disappointed that Regina banished Zelena back to Oz? Jim: The whole scene seemed straight out of a "Wrapping up lose ends 101" class. I honestly got so bored with the Zelena character that I really didn't care. Allison: Same here. It was just so weird that this came on the heels of Robin and Regina giving Zelena a chance to spend time with her daughter in hopes that Zelena be a better person. Also, how does this child not have a name yet? Amanda: This was a weird moment, but I'm glad she sent her back to Oz. I never liked Zelena becoming a more prominent character because she felt like just a obstacle for Regina and Robin and not her own person. Robin: Well, I've been quite vocal about how much I dislike Zelena, so it really didn't matter to me how she exited Storybrooke. I'm just glad she's gone. Were there any plot points or questions from the Camelot story you felt should have been wrapped up in this winter finale? Jim: Several, including Arthur killing his squire and/or Arthur attempting to kill/capture our heroes (they got their memories back right?). Allison: While it's annoying that we just ditched Camelot, I didn't care because I found all the stories to be boring. Don't invest so much time in characters if you're not going to give any sort of closure. Amanda: I'm also in the same boat about Camelot being a tad boring. However, I would have liked to see more resolution with Arthur and Guinevere. Robin: Wow. I completely forgot Arthur and Camelot existed. I didn't miss him even slightly. I don't even remember the last time we saw Arthur, or whether it was relevant to the current story. In an ideal world, the Arthur-is-a-lunatic story would have been wrapped up, and he would have gotten justice by this episode. That said, I'm just as content never seeing him again. What do you think of Rumplestiltskin choosing to be the Dark One once again? Jim: I said the same thing I said when they lost their memories in the first episode.. "Again, uggggh!" Gold had worked so hard to become a better man I just couldn't see any reason he would decided to go back to being the Dark One. He knows he will lose Belle, so it just reeks of "we need a bad guy". Allison: It was great for shock value because you did not see it coming at all. That being said, I wish it would have never happened. We are back to square 1 with Rumple and Rumbelle. I'm so over this. I am worried that Belle will end up pregnant, and then we will have a storyline of Rumple trying to be good for his child. Amanda: I rolled my eyes. We are back to the same place as before. It's not a surprise that Rumple would jump at the chance to get his power back, but I'm more infuriated at where this leaves Belle (again!). How many times are we going to watch Belle think Rumple has changed when in reality he is playing her? Enough with this storyline. Robin: While the process itself made no sense, I'm quite glad that Rumpelstiltskin is the Dark One again. I enjoy Robert Carlyle as a villain much more than as a so-called hero. That said, like everyone else, it is annoying that it's being done at the expense of Belle yet again. To make matters worse, now every main character is lying to her about it. What was your favorite quote, scene, or story from this episode? Jim: I loved that Killian finally was the man he wanted to be and stopped all the dark ones. Allison: I was so happy to get some Killian backstory. I loved seeing him as a child and seeing how much his father played a role in the man Killian became. Also, how twisted is it that his dad named his third son Liam?! Amanda: Definitely going with the scene where Emma had to kill Killian. While I was shocked to see this development, it made sense considering she couldn't let him die a hero the first time around. Also, I couldn't help but flash back to when Buffy had to kill Angel with a sword and sent him to hell on Buffy the Vampire Slayer. Robin: Good grief, can Colin O'Donoghue die or what?! The scene where Emma kills Hook absolutely broke my heart. Though an honourable mention goes to Regina and Hook at the waterfront. When she called him Killian even I was surprised, and Hook's response of, "Wait, no Captain Guyliner? Where are the bon mots now?" cracked me up. 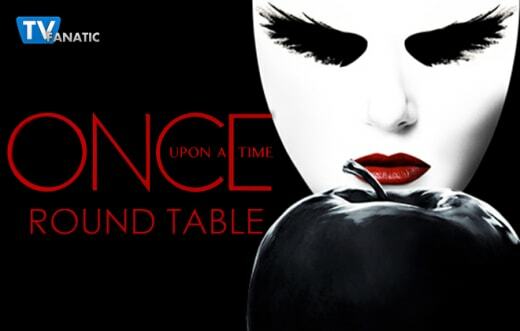 What do you hope to see when Once upon a Time Season 5 returns in March? Jim: New writing (new writers if needed), so we have less regurgitation of story tropes from earlier seasons of the show. Allison: Yes, let's mix things up! I'm a little disappointed that the underworld is basically Storybrooke. I was hoping for an exciting change. We've seen that a lot of familiar faces resurface in the underworld, but I hope that we really focus on our main characters. I don't need to spend most of the second half on some weird story, complete with flashbacks, about how Pan did something in the underworld. I'd actually be okay with no flashbacks at all. Amanda: I was disappointed as well to see that the underworld will be Storybrooke. I'd also like to see Belle figure out quickly that Rumple is the dark one again. The writers just keep making her look like an idiot, and that's not fair to a character that's supposed to be intelligent. Please keep everything in the same timeline, and NO MORE MEMORY LOSS! 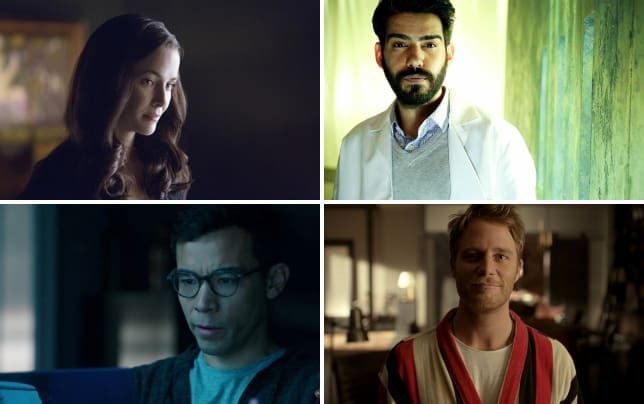 Robin: I'm looking forward to seeing them get through the underworld; while there are a lot of people who will have it out for them, there are also a few people that will have their back. I wonder if this will tie in with the Disney Hercules story as well? I'd also like to see Belle get more than the short-end of the stick. The whole town treats her like an afterthought, and this repeated Rumpel story is just too much. Check back next week for our Once Upon a Time Mid-Season Report Card and if you can’t wait until the show returns this March, you can always watch Once Upon a Time online here at TV Fanatic. We should all be scared. This is death itself. This is a fight we can not win. Permalink: We should all be scared. This is death itself. This is a fight we can not win. Regina: And you think we'll find Hook just sipping rum by the sea. He's not exactly a pirate any more. Robin: Once a pirate, always a pirate. Take it from a reformed thief. Old habits die hard. Permalink: Once a pirate, always a pirate. Take it from a reformed thief. Old habits die hard.